We ultimately want all who menstruate worldwide to have access to safe menstrual protection, as over 300 million women currently do not have this privilege. Girls miss up to 5 days of school a month and women are missing work; this leads to low attainment in school, missed work opportunities, lack of self esteem and exacerbation of the stigma & taboo that surrounds periods. Commissioning and conducting research on the economic, social and environmental impacts of period poverty in the UK and worldwide, and effectively communicating the results of this research to the public. 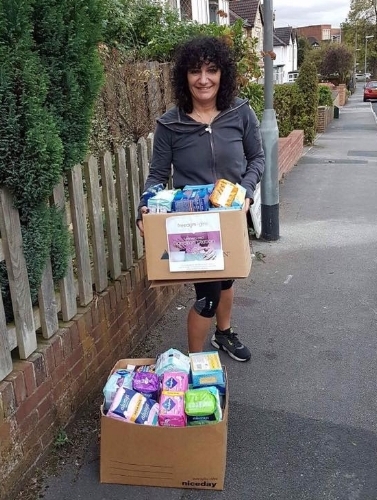 So far we've made some progress in supplying menstrual products to those in need within West Yorkshire, UK, but a huge amount of work remains to be done to achieve our goals nationally and internationally! Many of the pads and tampons that we distribute (with support from Fareshare) to schools, refugees, womens agencies and community groups are kindly donated by the public through our donation stations, but we have also been fortunate to receive significant donations from various organisations and groups; this includes companies such as Organicup, Tesco, Morrisons, Bodyform and numerous voluntary, community and faith organisations. Regardless of their origin, all menstrual products are very gratefully received, and we ensure that they are donated to girls and women who desperately need them! Over the past year, we have established a good network of volunteers within Leeds and West Yorkshire, who join us at our monthly sewing workshops; at these sessions we sew and assemble washable, re-usable sanitary kits for Days For Girls, an international charity that distributes kits to women and girls in developing countries, with the primary aim of ensuring that girls are not forced out of education due to their periods. Freedom4Girls have so far distributed over 4800 kits to girls in Kenya, Zambia, Uganda, Nigeria and the UK with support from Days for Girls and Maji Safi Projects, another UK-based charity. We have also been involved with setting up workshops in Kenya, in collaboration with Maji Safi Projects; these workshops aim to support local women by providing jobs to pull them out of poverty. Freedom4Girls also work hard on fundraising to increase the amount of research into the social and economic impacts of period poverty in the UK and worldwide. Such research is somewhat limited at present, so we are currently working on a number of funding bids and collaborations with academic institutions and government organisations to support this important subject. We are gradually tackling the stigma & taboo surrounding menstruation by working to educate and empower girls and boys, both in the UK and abroad. We're always keen to get involved with campaigns to reduce period poverty, so would love to hear from you if you have any ideas!